The unstoppable Naftali Group has let slip the first glimpse of its Upper West Side condo project at 210 West 77th Street. Dubbed “Two Ten West 77,” the 18-story building will be designed by Thomas Juul-Hansen, according to a new teaser site with an optical illusion of a logo (it throbs!). 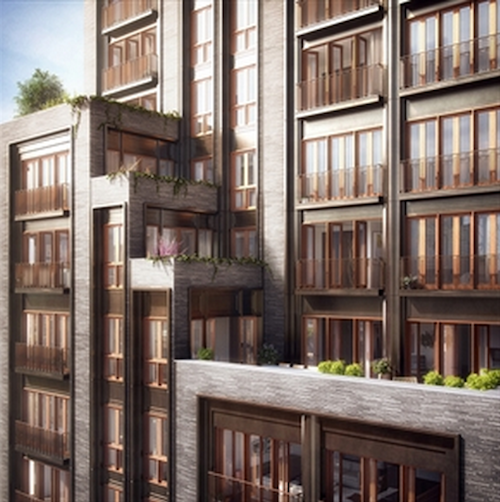 Located between Amsterdam Avenue and Broadway, the development will sport natural materials, a “custom hand-formed brick facade,” Juliet balconies with floor-to-ceiling mahogany windows and stepped terraces cascading down the top floors. The 25 residences will be half-floor and full-floor units. Amenities include a doorman, common roof deck, gym, meeting room, package room and private storage. Naftali purchased the property, a Hertz garage at 206-210 West 77th, for $55.5 million. Permits filed in January and approved last month call for 2,317 square feet of retail on the ground floor. Goldstein, Hill & West is the architect of record. The condo offering plan, with an initial price of $190.825 million, was approved August 21st. Naftali’s recent projects include The Seymour in Chelsea and 234 East 23rd Street in Gramercy.